The second opening theme to Valvrave the Liberator, Kakumei Dualism goes down the ani-rock path instead of the electronic route of the first OP. Where Preserved Roses was energetic but formulaic and somewhat lacking, Kakumei Dualism has huge amounts of adrenaline running through its veins. It’s really obvious in T.M.Revolution’s vocals. His delivery exudes fury and anguish, and stands out to me the most, even though the vocal lines are shared evenly with collaborator Nana Mizuki. Too much of a good thing? In this case, yes. I do like how expressive he is, but it becomes overbearing and excessive, and it would be better if he saved that extra bit of fire for key moments in the song. It bothers me less now than when I first listened to it, but I still would have liked Takanori’s vocals to be smoothed out. The arrangement and instrumentation is quite strong though, and I love the rock direction. The double kick drums and growling guitars keep with the fierce theme, while swathes of strings act to calm things down a little and provide richness to the arrangement, The bass is clunkily good, shown in the slap line of the second verse, and the twin vocalists harmonise brilliantly. The only unnecessary part was the short fanservice rap from T.M.R, otherwise it was perfectly fine. As the successor to Preserved Roses, I think we can safely say Kakumei Dualism blows the first collaboration effort into outer space. What to take out of this: Elements Garden composers smash Daisuke Asakura. I said on my review of Preserved Roses that I was pretty happy with it, but since then I’ve changed my mind, and think zzeroparticle was on the right track with his review. Preserved Roses didn’t stick with me that much, but I’m hoping that this time I’ve managed to get it right. Kakumei Dualism wasn’t breaking any boundaries, but it is a great example of anison done right. This entry was posted in Nana Mizuki, T.M.Revolution and tagged anison, elements garden, jpop, jrock, kakumeiki valvrave, nana mizuki, single review, t.m.revolution, takanori nishikawa, valvrave, valvrave the liberator. Bookmark the permalink. Oh my gosh, a J-Pop song I actually know of! Yes! You know, I agree that the first OP of Valvrave was a pretty generic song. I think T.M. 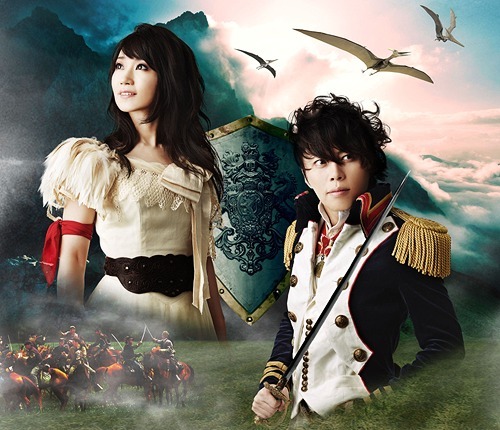 Revolution and Nana Mizuki have both done better on their own. Not sure whether it’s a case of boring arrangement or their voices just not gelling together. Whatever the case, I’ve not thought much of either OP of Valvrave. Yay you know a song! Regarding the first OP, I’m going with the arrangement being the main issue. I dunno whether you’ve heard much T.M.Revolution, but waaaay to much of Daisuke Asakura’s arrangements follow the same formula, so it was a bit disappointing for Preserved Roses. This has nothing to do with anything but that cover art for the single is really retarded. Just… thought I’d throw that thought in there. I haven’t listened to this song yet, but yeah Preserved Roses was overrated. I get it a try, but it just.. didn’t work for me… Oh well. Lol… well listen to this one and see what you think of it. I really prefer the new song, because it has Nana’s signature in it. And obviously because the writer of the song is one that normally writes Nana’s songs. Yeah the composer seems pretty cool. It has written some of the famous songs of Nana.